Eero Saarinen was a world renowned architect that was born in Kirkkonummi. Finland and lived most of his life in the Detroit area. Among his many architectural achievements, Eero Saarinen designed the Jefferson National Expansion Memorial, (more commonly known as the St. Louis Arch), that appears on the Missouri State Quarter. Some of his other architectural achievements include the Washington Dulles International Airport, TWA Terminal at JFK International Airport and last, but certainly not least, the sprawling General Motors Technical Center1 in Warren, Michigan, which he designed along with his father, Eliel Saarinen. Eero Saarinen has a numismatic connection, with one of his most iconic architectural achievements being commemorated on the aforementioned Missouri Quarter, and the architect himself being commemorated on a 2010 Ten Euro commemorative silver coin issued by Finland. 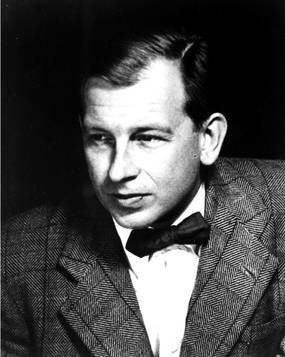 Eero Saarinen was born on August 20, 1910. He emigrated with his parents to the United States in 1923, growing up within the community of Cranbrook Academy of Art in Bloomfield Hills, Michigan, where his father taught. He became a naturalized American citizen in 1940, after having studied sculpture in Paris, and completing his studies at the Yale School of Architecture in 1934. He worked with his family at Cranbrook Academy of Art, and taught at the academy. After his father's death in 1950, Eero founded his own architect's office, "Eero Saarinen and Associates," located in Bloomfield Hills, Michigan, until Saarinen's death during an operation to remove a brain tumor in Ann Arbor, Michigan, on September 1, 1961. Eero Saarinen was buried in White Chapel Cemetery in Troy, Michigan. His second wife, Aline Saarinen, herself a noted NBC Television correspondent and writer, passed away in 1972 and is buried next to him2. One of Eero Saarinen's most famous numismatically relevant designs appears on the United States Missouri State Quarter, issued in 2003 as part of the United States Fifty State Quarter series. 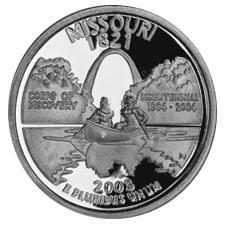 The design depicts Lewis and Clark's historic return to St. Louis down the Missouri River. The background of the design depicts Saarinen's St. Louis Arch. The words "Corps of Discovery 1804-2004" marks the bicentennial of the Lewis and Clark expedition. The remainder of the design is consistent with the State Quarter Template: the name of the state at the upper ring, above the date the state entered the Union. At the bottom, the date of issue – 2003 – above the motto "E Pluribus Unum." 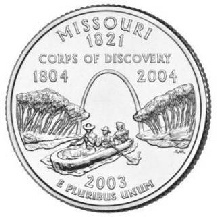 The Missouri Quarter, like all the Fifty States and Territorial Quarters, was issued for circulation in the familiar cupro-nickel composition. Circulation strikes were struck at the Philadelphia and Denver Mints. In addition, proof examples were struck in both cupro-nickel and .900 silver at the San Francisco Mint. The Missouri Quarter is commonly available, 225 million were struck at the Philadelphia facility, another 228.2 produced at the Denver Mint, plus 3.4 million cupro-nickel proofs and 1.125 million silver proofs struck at the San Francisco Mint. The obverse of the coin depicted the familiar John Flanagan portrait of George Washington originally on the quarter dollar since 1932, but modified by engraver William Cousins for the State Quarter series. Alfred Maletsky engraved the reverse of the Missouri Quarter, and his initials AFM appear in the lower right in the water. Although he is not credited on the coin, Missouri artist Paul Jackson developed the design concept, which the United States Mint changed fairly radically. A huge controversy broke out regarding this design, and is a story which goes far beyond the scope of this article, but a related numismatic item was produced: a private mint-struck "coin" depicting Jackson's original design. Since it is relatively common and also depicts the St. Louis Arch, a collector wishing to secure an item with a connection to Michigan's Eero Saarinen may wish to acquire one of these silver clad issues, struck by a private company identifying itself as The National Collectors Mint, Inc., as well. This private issue closely follows the Paul Jackson design and was struck on a copper core with a .999 silver layer. It is 5.24 grams and 24.3 mm in diameter, has a reeded edge and is struck in coin alignment. Eero Saarinen is the topic of a recent commemorative 10 Euro coin being issued by Finland in honor of the architect's 2010 birth centennial in Finland. 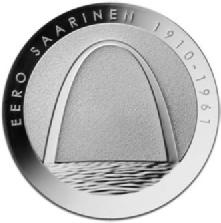 This sleek, modern-looking design, selected as part of a Finnish national coin design contest, depicts the silhouette of the St. Louis Arch on the obverse along with Saarinen's name and the dual dates 1910 1961, representing the years of his birth and death,surrounding the top of the coin. The reverse shows an example from the series of tulip chairs designed in corroboration with Hans Knoll. The tulip chair became the basis of the seating used on the original Star Trek television series, and is still a popular seller in the furniture market. 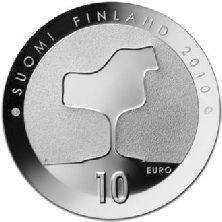 The words SUOMI FINLAND 20103 appear around the upper rim of the reverse, with the denomination 10 Euro4, appearing near the center of the design beneath the silhouette of the chair. Overall, the design is smooth, uncluttered and unpretentious, and reflects the design sensibilities and style of the architect that it honors. The .925 fine silver Ten Euro "Eero Saarinen and Finnish architecture" coin was designed by Juha Kauko. The coin weighs 25.5 grams, measures 38.6 mm and is being struck in proof and uncirculated versions. It was issued in January 2010, with set mintage figures of 6,000 uncirculated and 20,000 proof. Eero Saarinen was one of America's foremost architects of the last century. His contributions to design permeate many aspects of our modern society. He lived, died, and is buried in Michigan, and during his relatively short lifetime, left a monumental body of work spanning the globe. Certainly for collectors interested in a numismatic tribute to a great architect with a significant Michigan connection, there are a couple less-than-obvious choices - the Missouri Quarter and the Finnish 2010 Eero Saarinen Commemorative being two of them. Commemorative Coins of Scandinavia Since 1900, Complete Descriptions, Charles R. Hosch, Marietta, GA, 2008 Edition. "Finland Selects Gateway Arch," Jeff Starck, Coinworld, January 4, 2010, pg 70. America's State Quarter; The Definitive Guidebook to Collecting State Quarters, David L. Ganz, Random House Reference, 2008. "The Purpose-Driven Wife," Cathleen McGuigan, Newsweek, November 16, 2009. Pages 58-59. 1) The General Motors Technical Center in Warren, Michigan, has another notable numismatic connection. It was the site of the development of the so-called United States Mint roller press. 2) www.Findagrave.com, under Eero Sarineen and Aline Sarineen. 3) Suomi is a Finnish word that refers to Finland, also to the Finnish language. 4) Prior to Finland's adoption of the Euro, the currency was the Markka. At the time of the conversion, One Euro = 5.94573 Markka.